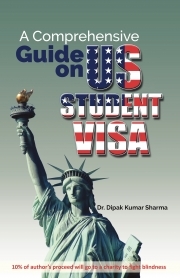 Description of "A Comprehensive Guide to the US Student Visa"
1. Do you want to study in America, but do not know the in and out of the US student visa procedure? 2. Have you never faced a US visa interview or have been rejected at the visa interview? 3. Are you tired paying a 100 USD for a half hour discussion with an Immigration Lawyer? 4. Do you want to keep away from the touts and fraudulent guys trying to cheat students applying for the visa? 5. What are the visa difficulties during transit to the US? 6. How to face the immigration on arrival at US border? 7. If you want to change your University, how does it affect your student visa? 8. What are your rights to access government records in the US? 9. Are you Eligible for a Social Security Number (SSN)? 10. Did your student visa expire while you were inside the US? 11. How to do a job legally while you are still a student in the US? 12. Can you apply for two different visa types together? 13. What are your TAX liabilities as a student? 14. Did you lose your passport inside or outside the US? 15. What is the path from student visa to an American Green Card? 16. Before you go to the US learn how to prepare documents, fill in the visa application form, and appear for an interview. 17. After you land in the US, know about registration on arrival at US, visa rules applicable to ‘planned exit’ at the end of the course, and about using OPT/Pre-OPT and CPT for jobs or training. Know all this and much more, in a compact yet very informative Revised 2018 edition book. This book is basically a ‘Mother of All Books’ on US student visa. This book will make a difference between being in the US and succeeding there. It is written in an easy to read, step by step fashion with FAQ in every section. Hundreds of real-life scenarios covered and explained by the author who is a former F-1 student at Johns Hopkins University. I teach or travel. Sometimes I write too. I am a Nomad. Mother earth is my home. I have lived and worked in five countries extending from Asia to America, and have traveled probably two dozen more. I have been in several roles including being a Clinician, Public Health expert, teacher, student, researcher, and traveler and of late have a newly added passion of writing and publication. I am a medical graduate from India and a former F-1 student who joined Masters in Public Health (MPH) at the Johns Hopkins University in 2010. Teaching medicine and traveling are my passion. Listening to soft instrumental music, cooking and net surfing is my other favorite pass times. The journey of life still seems to have just begun. As a human being, I am yet to realize my potential. I am still evolving. I have yet to fight to conserve nature, save animals, fight for peace, and discover a new medicine or a vaccine. This entire life seems too short for that. I am a vegetarian by the way and enjoy cooking by myself too. Reviews of "A Comprehensive Guide to the US Student Visa"